Russian gas behemoth Gazprom has turned down a request by Poland to increase gas supplies, obliging Warsaw to cut short reverse supplies of Russian gas to Ukraine. Gazprom believes that these kinds of supplies are illegal and thus contradict the points of the contract. Russian gas monopoly Gazprom has refused to boost deliveries of gas to Polish consumers after Poland’s state oil and gas firm requested an increase in supplies due to cooler weather. As a result, Poland has been obliged to halt reverse supplies of gas to Ukraine. Gazprom did not satisfy a request by the Polish Oil & Gas Company (PGNiG) for an increase in gas supplies, according to the Polish company's official statement. Poland did not receive approximately 20 percent of the requested amount. In turn, Gazprom announced that Poland is being supplied with the same volume of gas as before: 23 million cubic meters daily. However, the company claims it cannot increase supply volumes since it is currently piping gas into underground storage tanks for domestic use. Consequently, on September 10, Poland was obliged to halt reverse supplies of Russian gas to Ukraine. Previously, out of the gas that Poland paid for, PGNiG would sell 4.2 million cubic meters to Ukraine's Naftogaz. "Once again Gazprom is demonstrating the strength of its negotiating position," says UFS IC's chief analyst Ilya Balakirev. "This should tell the EU that the Ukrainian issue must be resolved as soon as possible. It is also a reminder for Ukrainians that they live in a real world and that no reverse gas flows will be able to ensure all of Ukraine's gas needs, especially in the periods when they are most felt, that is, with the arrival of the cold season,” says Balakirev. He added that Europeans are not against selling gas excess when it is surplus to requirements, “but not when Europeans themselves lack them." According to Ivan Kapitonov, Deputy Chair of RANEPA's Government Economy Regulation Faculty, "Gazprom's stabilization of supplies on a level of minimal contractual obligations is a natural step in the context of the continual reverse gas flows to Ukraine." In his view, Ukraine, along with its western partners, utilizes an absence of contractual restrictions on the reselling of gas. "With the coming of autumn the consumption of gas used for heating will increase," adds Kapitonov. "There is nothing that can supplement Russian gas with the growth of EU consumption, nothing - neither now, nor in the near and foreseeable future." In such conditions Gazprom's decision to “stabilize” gas supplies is a legitimate response, one that falls within the framework of contractual obligations, according to Kapitonov. After Gazprom increased the price of gas for the Ukrainian Naftogaz from $268 to $485 per 1,000 cubic meters, Ukraine renewed its reverse imports from Poland and Hungary. Gazprom believes that these kinds of supplies are illegal, since the gas is resold on Ukrainian territory and is then sent to Ukrainian consumers, that is, the reverse is effectively virtual, which, according to Gazprom, contradicts the terms of its contract with Ukraine. Furthermore, Ukraine's gas debt to Gazprom is more than $5 billion. "The reverse flows can physically be organized only by Ukraine's closest neighbors, and paradoxically, the majority of these countries themselves have a shortage of gas," says Balakirev. "In reality, only northern European countries, such as Germany, have free gas." Therefore, only Poland and Slovakia can actually supply Ukraine with excess gas. Along with the reduction of gas supplies to Poland, at the beginning of September Gazprom began reducing supplies through the Yamal-Europe pipeline to Germany. According to German gas supplier GASCADE, between September 3 and 10 daily supplies were reduced from about 82 million cubic meters to 73 million cubic meters. A representative of Slovensky Plynarensky Priemysel, the key Slovak natural gas supplier, announced that the Slovak company also registered a reduction of supplies from Russia by 10 percent. According to Finam Management's chief expert Dmitry Baranov, the solution to the gas reverse problem is of a juridical nature. 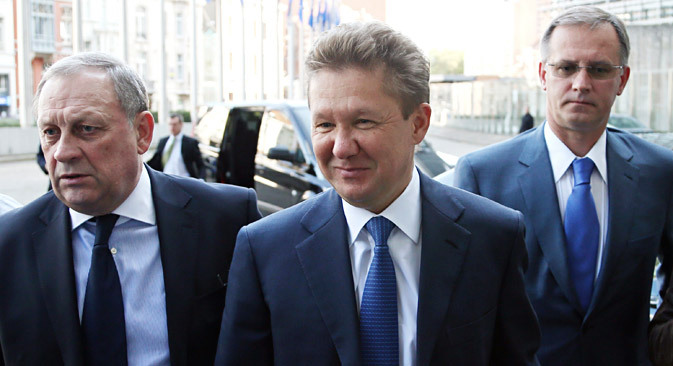 Gazprom has already announced on several occasions that it will take legal action if Europe begins reversing Russian gas. "There is an agreement between Gazprom and the European governments that clearly states in which volumes, according to which price, and - most importantly - in which conditions Russia will supply gas to Europe," says Baranov. "And if the reversal of gas is not mentioned in the agreement, then it is something that should be decided in court." In Baranov's opinion, the best way to resolve the current problem is to reach an agreement between Russia, Ukraine and the EU that would answer all the questions the three sides may have. "I believe that an agreement can be reached," adds Baranov. "The sides just have to minimize the influence of politics and concentrate on the economic aspects of supplying gas."